Akris "Carl" pants in double-face wool. 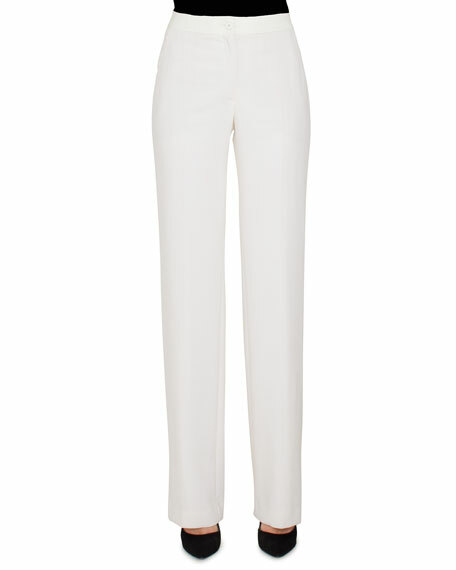 Caroline Rose silk crepe pants. Pull-on comfort-stretch elastic waistband. Relaxed straight legs skim the body. Unlined. Dry clean. Made in USA of imported material. Model's measurements: Height 5'10"/177cm, bust 33"/84cm, waist 25.6"/65.2cm, hips 35.8"/91cm, dress size US 2-4/FR 34-36. Caroline Rose stretch-knit pants with gathered pleats. Approx. measurements: 13.5" front rise, 15.5" back rise, 31" inseam, 42" outseam, 21"